Cape Town - Springbok coach Allister Coetzee has tried his best to shrug off Saturday's 57-0 loss to the All Blacks in Albany as a "once-off" result, but the South African rugby public are not convinced. In three Test matches against New Zealand under Coetzee, the Boks have now conceded 23 tries - and scored just a single five-pointer in return. READ: SHOULD ALLISTER STICK TO MORE SPECIALISTS? It has led to more calls for change, both in coaching staff and in player personnel. Exactly what Coetzee does with his squad ahead of next weekend's clash against Australia in Bloemfontein remains to be seen, but there are a number of areas where he will have to make a few big calls. Here, we look at some of the positions where we might see Coetzee change it up from the side that suffered the worst defeat in Springbok history. When Raymond Rhule first came into the Springbok set-up, his defensive capabilities emerged as the immediate concern. Those fears were realised on Saturday as he slipped 9 tackles. It is hard to see Coetzee backing him again, while a call to Japan to get Ruan Combrinck back in the fold might be on the cards. Coetzee could also turn to JP Pietersen while, locally, there is Dillyn Leyds and Makazole Mapimpi. Jaco Kriel's injury has resulted in calls for Francois Louw to be recalled. The loose trio against the All Blacks saw Uzair Cassiem at No 8, Jean-Luc du Preez at No 7 and Siya Kolisi at No 6. The jury is still very much out on Cassiem's effectiveness at the back of the scrum, and the inclusion of Louw would allow Du Preez to move there. Kolisi, though, has been fantastic at No 6 and Coetzee might be reluctant to shift him to the other side of the scrum to accommodate Louw. 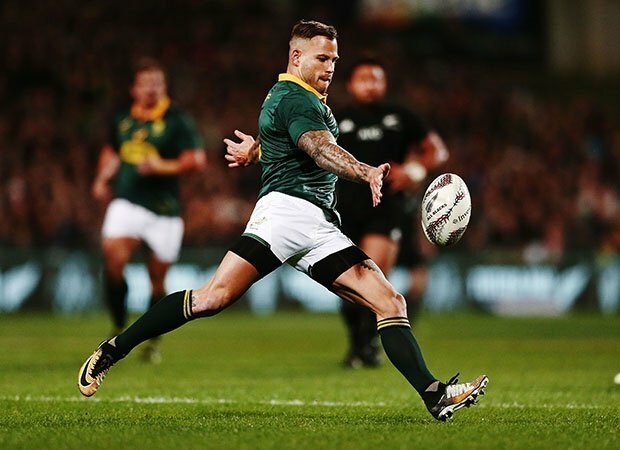 Francois Hougaard has not done anything for his Bok credentials in 2017. Whether coming off the bench or getting a start, the 29-year-old has been poor. Ross Cronje is expected to have recovered from illness for Bloemfontein and he will surely walk back into the starting XV. But, on the bench, Coetzee must consider turning to Rudy Paige ahead of Hougaard. Coenie Oosthuizen's injury has thrown a bit of a spanner into the works, as Ruan Dreyer and Trevor Nyakane were both exposed badly against the All Blacks. There are, unfortunately, a number of front row injuries with Frans Malherbe also out. The one option that Coetzee does have is in-form Western Province tighthead Wilco Louw. Will Coetzee back the combination of Jan Serfontein and Jesse Kriel in midfield? He has spoken very highly of that partnership all year, but they did not fire on the Australasian tour. Damian de Allende is waiting on the bench while, domestically, Rohan Janse van Rensburg and Lukhanyo Am are real options.